The volume focuses on the interpretation, in particular, of three passages: the Nephilim (6:1-4), Noah (6:9-9:29), and the Tower of Babel (11:1-9). The central question is this: did the stories in Genesis really happen? (p. 156). Halton gives this thumbnail summary: “Hoffmeier says yes, Wenham says sort of, and Sparks says probably not” (p. 156). Despite the reflections of some very misguided blog reviews, this is not simply a matter of being “conservative” or “liberal.” Sparks is lampooned by some bloggers for being too liberal in disposition (and, thus, not really evangelical). I had the privilege of teaching at Eastern where Sparks serves as an administrator. He is a godly believer, taking Scripture with the utmost seriousness. There are a lot of hermeneutical and philosophical considerations that go into the disagreement between the viewpoints. You have completely missed the point of the book if you just “choose your favorite” view. I am only going to say two quick things about the book. Firstly, I resonated strongly with Wenham’s case for “proto-history.” He wants to avoid the baggage of using the word “myth” despite the clear theologizing of the Genesis writer. 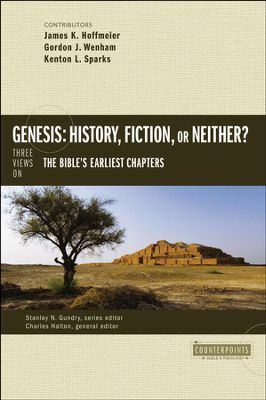 Wenham describes the kind of history-writing in Genesis 1-11 as a “portrait of the past” (not a photograph; p. 87).In this case, one simply cannot sift out the factual/historical details from the theology or parabolic elements. And, for Wenham, one does not really need to. Yet, there are enough clues for Wenham to think that the Genesis writer is trying to represent something that comes from that past. This leads me to my second note. How does one determine genre anyway? When we study various biblical books, we usually begin with a genre and then move to studying the text in light of that genre. However, Genesis 1-11 is so unique, that is almost impossible. In the end, we tend to muddle our way through the bits and then think through the genre in light of these bits. But how can “method” really help? Whose method? With what results? As with most of the other books in the Counterpoint series, the point is not the settle the matter by having one contributor “win.” Rather, the benefit is in the discussion itself, seeing the complexity and challenges for what they are. We will have our leanings, but at the end of the day the book is far from closed. If you are interested in continuing to reflect on the relationship between science, history, and theology in Scripture, this is very worthwhile. If you just want answers or to have your camp “win,” it won’t do you much good. Thanks for your review, extremely helpful! This is a very sensible approach. However, it does seem that the flat earthers continue to present the 10,000 year old stuff and ignore the daily posts in paleontology news. Thanks again. Just tweeted the link. Thanks, David. Saw the video for your new book! Very exciting! Nijay, this has been on my wishlist since I first saw it available on Amazon as a pre-order, so I’m glad now to see a review. I’m more interested in Genesis 1-3 than in Genesis 6 and 11 – is there any discussion of these chapters in the book? Or does the book’s value lie in the methodology on display? I think because the Counterpoints Historical Adam book covered Gen 1-2 pretty solidly, they wanted to make sure they were doing something different enough to justify another book. So, they don’t deal with Gen 1-3 very much at all.